A photovoltaic (PV) solar cell converts sunlight into electricity thanks to the photoelectric effect. The solar cells are connected to form modules, which are then either connected to a DC load or connected to inverters in order to convert the DC into alternating current (AC). The output from the inverters is thus fed into the grid for consumption. 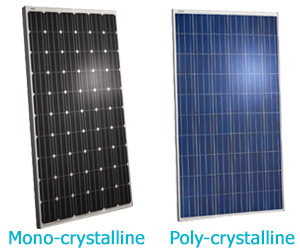 PV modules used on the market today are mostly crystalline silicon (cSi) based modules, either mono-crystalline or poly-crystalline. However, there are many other technologies available, like thin-film, or being investigated. Thin-film solar cell is also a silicon-based technology consisting on using silicon wafers up to 200μm allowing it to be flexible. Thin-film is commercially used in several technologies like amorphous (a-Si, TF-Si), cadmium telluride (CdTe), and copper indium gallium diselenide (CIGS). A grid-tied solution suitable for industrial and commercial applications working in synchronisation with the internal grid and saving on the EDL and diesel bill. A stand alone solution most suitable for remote areas with no connection to an electricity source (utility and/or diesel generators). A smart solution combining grid-tied and stand alone applications, most suitable for homes allowing the elimination of the generator subscription. Storage systems can be beneficial in many renewable energy applications and cases. The basic operation of such a system consists in storing electric energy produced from the solar energy for later use. The stored energy can be used to supply loads in the event of a power cut while the sun is not shining (i.e during the night). This energy can also help compensate the intermittent aspect of the solar energy (i.e clouds). The smart home PV system for example manages storage to maximise the use of PV generated energy and minimise the waste of this solar energy. However, storage solutions can be added to any PV system. Solar energy is usually stored in batteries specially designed for solar applications. Battery banks are designed and customised to meet every client's need. As the name implies, solar street lighting is a solar powered lighting solution designed for streets. Solar panels are generally mounted on a lighting structure and charge batteries during the day which powers LED lamp during the night.Two types of solar street lighting can be identified: independent system and centralised system. The independent system consists of 1 or 2 solar panels, a solar charge controller, a LED lamp, and 1 or 2 batteries. Each system powers one single pole independently from the others. Batteries can be mounted on the pole or buried underground. The centralised system consists of a solar installation connecting several solar panels and a centralised storage station powering a series of LED lighting poles.